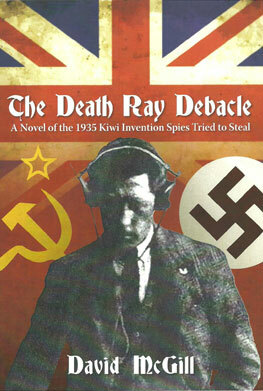 In June 1935 Takapuna inventor Victor Penny was attacked by foreign agents seeking what the newspapers dubbed a ‘death ray’. The government secretly shifted him to Somes Island in Wellington harbour to develop the weapon. The novel of this true story is told by Temporary Acting Detective Dan Delaney, seconded to Special Branch, forerunner of the Security Intelligence Service. Special Branch is monitoring the German Club in Auckland, an increasingly shrill supporter of the Nazi regime. The unconventional Auckland theatrical scene has made sensational headlines with the alleged murder of his wife by impresario Eric Mareo, his accuser the bisexual dancer Freda Stark, lover of his deceased partner. A mysterious German/Jewish refugee has been involved in both the German Club and this Bohemian scene, making her a person of interest to the young detective and a recently arrived German diplomat. The detective and a helpful Scotland Yard adviser pursue and are pursued by spies determined to steal Penny’s blueprint. Round-the-clock protection is provided for Penny by armed soldiers on the supposedly secure Somes Island government facility, used to imprison enemy aliens in the Great War. Corruption on the island is uncovered by the detectives as they face lethal force to acquire an invention all major countries are actively chasing. Using private, media and archival sources, the author reveals the hidden layers threatening a country emerging out of the Depression with little idea of the forces about to plunge it into another world war. Foreign agents want Victor Penny’s game-changing weapon, but also control of New Zealand’s role in the coming conflict. 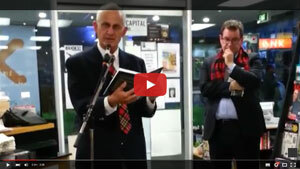 The author’s 52nd book depicts New Zealand at the crossroads of change, for better and for worse. ‘Romped through the book about Vic … in the form of a spy story. Couldn’t put it down.’ Evan Penny. ‘New Zealand’s first spy story.’ The Wellingtonian, 5 November 2015. ‘Mixing history and fiction into a good old yarn.’ Jim Sullivan, Sounds Historical, National Programme, 13 December 2015. ‘A fast-paced action spy story … builds to a great climactic finish. If this is ever made into a film the director will need not look any further for an accurate chronicle.’ Tim Gruar, Booksellers NZ Blog, 30 May 2016. ‘McGill’s writing shines where he is building a sense of place and time. It’s particularly strong on the minutiae of life in that period.’ Karen Chisholm, creator of Australian Crime Fiction blog.